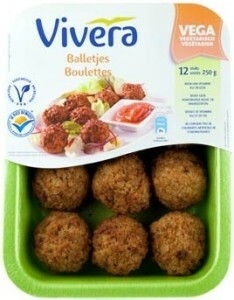 In the vegetarian area of Dutch supermarkets and at organic shops, 2 kinds of meat substitutes are offered. a. The traditional meat substitute : Already 2.000 years on the market and blown over from Asia to Europe: tofu (tahoe), tempeh and seitan. b. The newer products: they seem like meat, poured into a sausage-, burger or schnitzel form. It is indicated on the label of which the meat substitute was created; such as soy, wheat, vegetables, cheese, or a combination of these. Most meat substitutes contain soy. That is why it is important to take note of the effects of soy cultivation, as explained below. Thanks to the port in Rotterdam, the Netherlands is a major importer of soy. A further part is exported. By far the biggest part is intended for cattle feed, and thus finally for our meat and dairy consumption. Where do we get the soy? Roughly 50 percent comes from Brazil, the rest from Argentina, de VS, Paraguay, Canada and Italy. Soy is produced on large scale, especially the export-cultivation in Brazil and Argentina. Because of the global growth in demand for soy, there is a rapid enlargement of the production location. Tropical forest and savanna are quickly becoming converted into soybean fields. If the expansion of soy cultivation is continued without prejudice, by 2020 almost 22 million hectares of Savannah and tropical forest will have dissapeared in Brazil, Bolivia, Paraguay and Argentina. The WWF has calculated that the loss could remain limited to 3.7 million hectares, if the cultivation is more intensive, but responsible and environmental rules are better enforced. A large part of the soy is genetically modified. Over time foods contain less GMOs. This is due to the fact that it is mandatory for all producers to mention this on the label and producers do not like that. The avarage European shows resistance to GMOs. This is then again massively hypocritical, because we have no trouble with eating meat from animals that do GMO animal feed have gotten. Additionally, the way we shop, we disregard the resistance to GMOs . - Pesticide resistant GMOs not always for that less pesticides are used. In some cases, even more pesticides in the environment. – Social aspect: farmers are becoming increasingly dependent on multinational companies, which pesticides and GMO crops on the market. They sell the pesticide and the crop that is impervious to there. – Do we know enough about the effects of modified genetic material on the environment in the long run? Is itpossible that the wanted variant of rapeseed also weed killer-resistant is? – Reproduction of GMO crops is not always controllable. A GMO crop can best crosses with a non GMO crop (applies only to cross bare crops such as corn and beets and carrots in the future, not for soy). The environmental movement points out that will be increasingly difficult to get even GMO-free food. – Ethical aspect: how far should humans go with intervening in nature? How feasible is the world around us? Whether GM-crops lead to decreasing or increasing quantities of plant protection products is highly dependent on the type of crop, the region in which it is grown, and the applied cultivation practice. It is not easy for the consumer to get 1 clear picture. There are various terms used, such as green, sustainable and responsible soy. Depending on the definition of the standard are not there rules about: forest clearing, fair trade, labour conditions, organic, use GMOs etc. On packaging one can read with what soy and thus with what criteria you’re dealing. There are at least six standards for “responsible” soy: organic, Fairtrade, EcoSocial, not genetically modified (GMO-free), Pro Terra and round table on responsible soy (RTRS). The latter possible allows GM soy too. Tofu: Also named tahoe, tahoe is the Indonesian name for tofu. 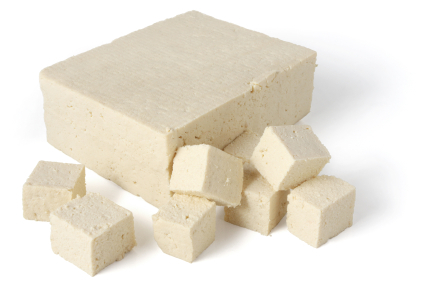 Tofu is made of soybeans and contains just like meat a lot of protein. In comparison, 100 grams of chicken contains about 20 grams protein, 100 grams of cooked tofu contains about 12 grams of protein . Tofu also contains carbohydrates, fats and minerals and vitamin b.
Tofu is made by soy milk to clot with a rennet (a naturally occurring mineral). It looks a bit like cheese and has little taste or smell, but easy takes the taste of herbs and/or sauces. 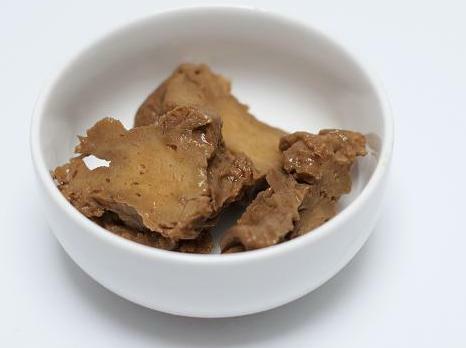 Tempeh: Tempeh is made by cooked soybeans to ferment with a Rhizopus mould. What can you imagine you there at: cooked soybeans go together with the fungus in a sealed bag with a few tiny holes and let this 2 days in a warm room. Bind the soybeans by the fermentation and the result is a solid white cake. 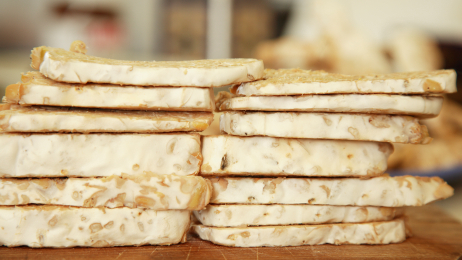 Tempeh is usually sliced and fried in oil or fried. Tempeh contains protein. In comparison, 100 grams of chicken contains about 20 grams protein, 100 grams cooked tempeh contains about 12 grams of protein. Moreover, tempeh carbohydrates, fats and many minerals and vitamin b.
Seitan: Seitan is originally from Indonesia. It is made from wheat gluten. Wheat gluten are gluten, a certain kind of proteins, which wheat contains. The production process is as follows: first, a dough made of wheat. By kneading this dough firmly gluten are formed. The kneaded dough is then rinsed with water to flush away the starch and bran. What remains is a glutenball, similar to chewing gum. The wheatglutenball goes in a pan of water with added tamari soy sauce, seaweed and ginger. To make seitan yourself takes quite a few hours, you can also buy it in the health food stores. The jars with pieces of seitan from the health food store look like pieces whole bread soaked in bouillon. It looks a bit like minced meat. Seitan contains as much or even more protein than meat. In comparison, 100 grams of chicken contains about 20 grams protein, 100 grams of cooked seitan contains about 24 grams of protein. Seitan also contains carbohydrates, iron and many minerals. Most meat substitutes contain soy. Some meat substitutes are made from a type of mould (Quorn), lupine (Meatless) (VegetarianButcher), another is made of milk (Valess). In june 2009 a report was published in which the environmental effects of the various meat substitutes were compared. 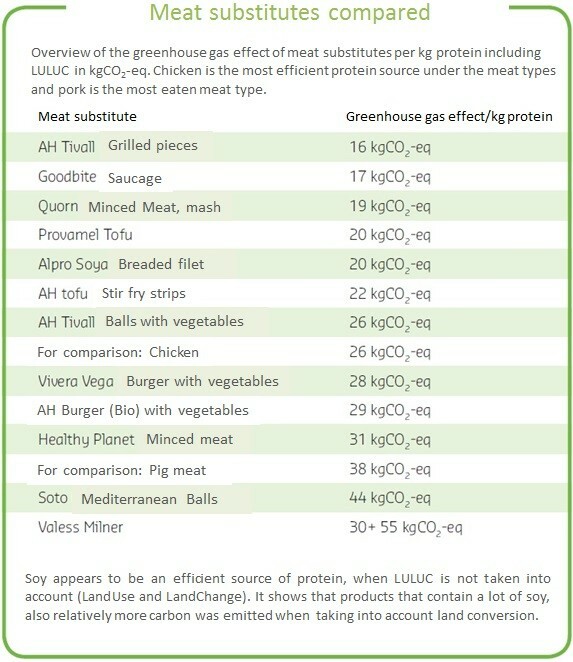 A little comparison, as far as greenhouse effect per tonne of protein, between meat and meat substitutes teaches us that meat substitutes are not necessarily a more efficient source of protein than meat. Figure: Overview of the greenhouse gas effect of meat substitutes per ton product. Conclusion: in relation to the new meat substitutes I apply the following rule: Anything above the environmental impact of chicken meat is not included in the recipes section. Tempeh, Tofu, Seitan, Meatless, VegetarianButcher, Quorn and meat substitutes, for example, Tivall, Goodbite and Alpro soya are in my estimation a good substitute for meat (provided cheese is not an ingredient).